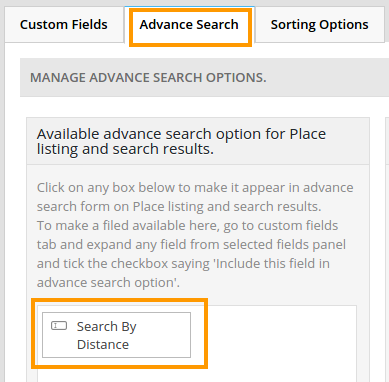 When you activate the Advanced Search Filters Addon, the Search By Distance field will automatically be added to the fields you can add to your custom search. Here you decide how many different search radii you make available to your visitors. 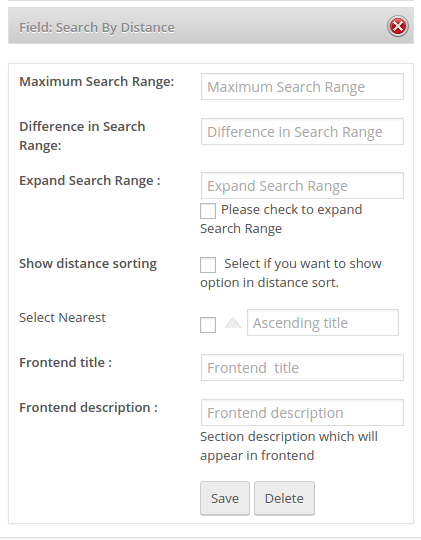 If you enter a fifth of the Maximum Search Range, there will be 5 options; if you enter half of the Maximum Search Range, then there will be 2 options. If you leave this blank, then all options as per Difference in Search Range will be shown. Entering a number lower than the number of options as per Difference in Search Range will only show that lower number of options, and will add a More link to expand the options so all will be shown. Tick this if you want your visitors to be able to sort the search results in order of distance, either ascending or descending. You will also need to provide text for the ascending or descending options. This will be shown as the heading of the Search By Distance filter. Optional description shown below to give your visitors tips about how to use the filter.